As the Syrian War nears its eighth year, the Syrian government faces fresh accusations of utilizing chemical warfare against its own people. The Syrian and Russian governments deny these allegations. This weekend Eastern Ghouta saw a bombardment of government led attacks, killing at least 20 civilians on Sunday, according to the Union of Medical Care and Relief Organizations (UOSSM). Locals have reported that chlorine gas was used in the attacks. Eastern Ghouta is the last rebel held area near the Syrian capital of Damascus. Last week the government intensified its attacks in Ghouta, killing 190 people, including civilians, the deadliest fighting in the area since 2015. After an explosion in al-Shayfouniya, ambulance drivers and locals reported smelling chlorine, according to a statement from the Ministry of Health of the Syria Interim Government. The Syria Interim Government is an opposition group headquartered in Turkish controlled Syria. The Ministry of Health claims, “At least 18 victims were treated with oxygen nebulizing sessions,” while local authorities have reported that one child was killed. The U.K. based Syrian Observatory for Human Rights (SOHR), has been closely documenting the humans rights ciolations throughout the Syrian War. This week they confirmed that one child had died in Eastern Ghouta from suffocation, but could not concretely say whether the suffocation was caused by chlorine gas. The Syrian Observatory for Human Rights has also reported that the attacks continued on Monday, bringing the death toll in Eastern Ghouta up to 556 civilians since February 18th, when the fighting intensified. The 556 civilians killed include 136 children and 80 women. In the North, SOHR reports at least 170 have been killed since February 20th, including 156 fighters and six children. Barrel bombs – sometimes filled with chlorine – are the biggest killer of civilians in Syria today. Our unarmed and neutral rescue workers have saved more than 99,220 people from the attacks in Syria, but there are many we cannot reach. There are children trapped in rubble we cannot hear. For them, the UN Security Council must follow through on its demand to stop the barrel bombs, by introducing a ‘no-fly zone’ if necessary. The Syrian government has been accused of using chlorine bombs as well as a deadly nerve gas, sarin. Sarin can cause death from muscle paralysis to the lungs in under ten minutes. During this time the victim will suffer from spasm and a loss of control of bodily functions. Because it is so deadly even at low doses, sarin is considered a weapon of mass destruction and has been illegal since 1997. Chlorine gas has a similar effect, destroying living tissue in the lungs and killing victims through asphyxiation. The U.S. on the other hand has made the accusation that the Syrian government is indeed using chemical weapons, specifically chlorine gas, against the Syrian people. The UN has likewise echoed these claims. Last year the Organization for the Prohibition of Chemical Weapons (OPCW) joined with the UN in an inquiry that found the Syrian government was responsible for an April, 2017 attack utilizing the nerve gas sarin, killing dozens in the town of Khan Sheikhoun. The joint inquiry also found that the Syrian government was responsible for three previous chemical attacks, using chlorine gas on civilian populations throughout the Syrian War. In response to the bombings in Eastern Ghouta, the rebels increased their attacks on Damascus, hitting civilian neighborhoods in the capital with mortar blasts. In another rebel stronghold, Idlib province to the north, medical aid workers as well as local residence have reported an increase in attacks, specifically targeted at hospitals and other medical infrastructure. Earlier this month, a video made its way across the internet depicting new born babies being rescued from the flames of a hospital hit by Russian airstrikes. Can the UN Lead a Successful Peace Initiative? This weekend the UN Security Council once again voted for a ceasefire in Syria. Saturday, the UN called for a 30 day truce in the region. 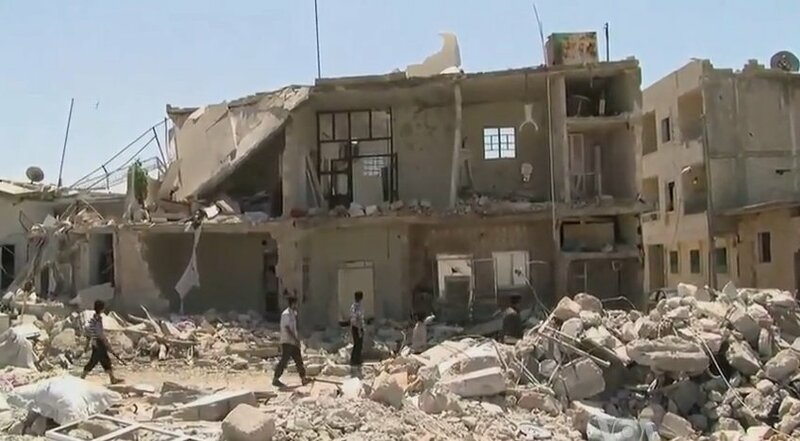 The Syrian government clearly ignored the demands of the UN, issuing fresh attacks on Sunday. Just a few hours after the Security Council vote, the Syrian government initiated a ground offensive in Eastern Ghouta. The UN reports that these attacks were, however, less intense than last week’s although it seems unlikely that the UN is to thank for that. On Sunday, a spokesperson of the German government said German and French leaders have been imploring Russia to put “maximum” pressure on the Syrian government to stop the fighting in Eastern Ghouta and observe the UN mandated temporary ceasefire. The German spokesperson said German Chancellor Angela Merkel and French President Emmanuel Macron have been in touch with Russian President Vladimir Putin to underscore the importance of the ceasefire as a step towards a peaceful resolution within the Geneva peace process led by the UN.